JetBlue has a long tradition of adding unique, special liveries to its Airbus A320 fleet and that tradition is expanding to the airline’s E190 fleet. Often referred to as the backbone of the operation in cities like Boston; Washington, D.C.; and San Juan, Puerto Rico, JetBlue’s design team created a paint scheme that showcased the so-called “bones” of the 100-seat aircraft. 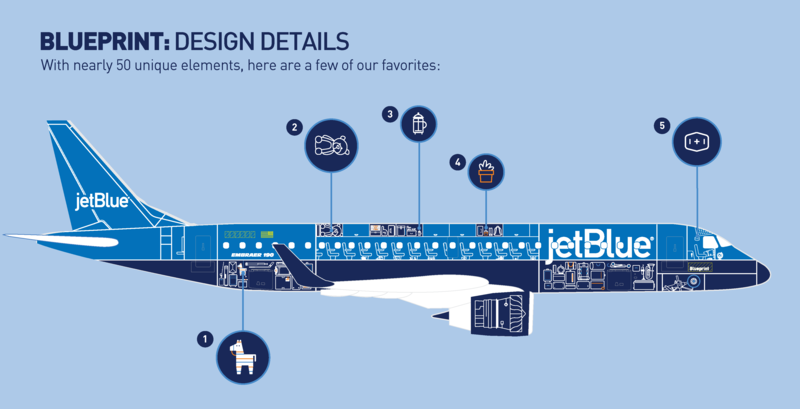 Drawing upon the styles of various aviation, nautical and space exploration vehicle cut-away diagrams, the JetBlue design team created a mechanical x-ray of sorts infused with some JetBlue fun. The see-through paint job draws on both the technical and fanciful aspects of air travel. Mechanical features like the nose gear, jet engine and yoke were among the more obvious design elements to include. But for the onboard features, JetBlue designers drew upon their own travel experiences, crewmember tales, and the airline’s loyal customers for inspiration, even creating fictional characters to compile a list of the items they might be traveling with. Plane spotters are encouraged to give the overhead bins, under-seat storage areas, and the luggage holds a closer look to see if they can spot the nearly 50 items these “Blueprint” customers are traveling with. 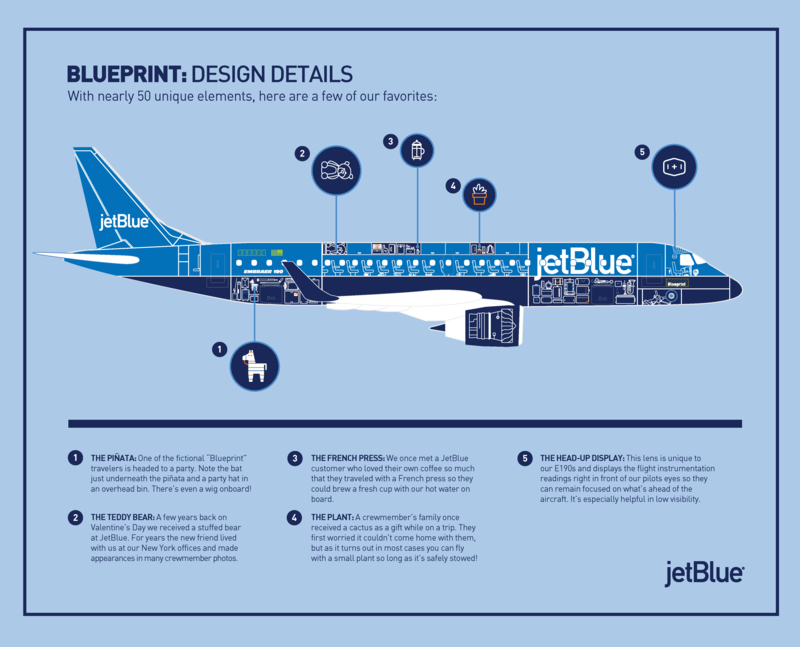 Although “Blueprint” features just three signature JetBlue colors, it is one of the airline’s most intricate special livery designs and took nearly two weeks to paint at a facility in Quebec. The first-ever JetBlue E190 special livery debuted at Boston’s Logan International Airport and will operate on routes served by the E190 throughout the JetBlue network.